What do you love best about Boston’s food scene, and what are some restaurants one shouldn’t miss? New York City is still the best food town in the world. They just have more variety than any other city in the world. Maybe Hong Kong is a close second. Boston is a small New York. The number one best thing that we have is seafood. We have the best seafood, I think, in the world. We have our lobsters, we have our Nantucket Bay scallops, we have striped bass, razor clams. We have Duxbury Island Creek oysters. We have the best seafood, period. It’s so good. We’re a huge melting pot. We have so many ethnicities in Boston. Dorchester is one of our towns that has literally a line of pho restaurants, all of these Vietnamese restaurants, like 20 in a row. We obviously have our Chinatown, which is a really great Chinatown. Gourmet Dumpling House is my favorite. We probably go once a week there. It’s a small 12-table dive, but fantastic homemade dumplings and really good spicy Sichuan style food. We have our version of Little Italy, the North End. Some great restaurants there, just solid restaurants, Neptune Oyster being exceptional. Not really that Italian, honestly, but exceptional seafood. They’re known for their incredible lobster rolls. Sticking to seafood, you go to Oishii in Boston. Chef Ting is the chef there. He does magic with fish. The fish is from Japan, but most of the fish probably comes from the East Coast, goes to Tsukiji Fish Market, and then flown back. But he’s a master with fish, especially obviously all his sashimi and sushis and things. Ting San is unbelievable. So we have the variety. We have every culture covered. I don’t eat that much French food honestly anymore, but our fine dining between Ken Oringer at Clio, Barbara Lynch at Menton … these are world-class restaurants. They’re as good as any 3-star restaurant in Paris or New York. *Editor’s note: Since publication of this interview, Clio has closed. The one thing New York has on us, honestly, is we don’t have slices of pizza every third corner. But they don’t have the No Name. The No Name is this seafood restaurant down on the pier that has no name. They give you a platter of fried seafood bigger than your head. We used to go there when I was at Andover ‘cause it was cheap and delicious and you get to BYOB to boot. Michael Schlow’s got a bunch of restaurants. He’s doing something that I very much admire. I just had the last meal … at Via Matta, which is a really good Italian restaurant. He’s had it for 12, 13 years, and he’s gonna open a kind of a Milos, a really higher end Greek restaurant [called Doretta Taverna and Raw Bar], which Boston does not have. I think it’s gonna do really well because Milos does crazy well in New York, but New Yorkers do pay a lot more for food. But to Michael’s credit, he’s pushing the envelope there. Then Ken Oringer has one of the best tapas places in the country, Toro in Boston; of course the one in New York is equally good. And Coppa, which I just had lunch at. Such good charcuterie and just smart cooking, so I put us Boston chefs up with any chefs in the country. We have the best Aussie patties. Pasties, they’re called, or meat pies. KO Pies, awesome. Great Aussie guys. And by the way, proof that we’re actually coming of age, New York chefs are coming to Boston now. The latest craze is Mario Batali; he just opened up Babbo here. It’s doing great. So the fact that now New York is coming to us, that says a lot. Daniel Boulud just came last year, so that really kind of justifies or legitimizes us in a way. We didn’t need that, but it’s nice to know that the Mario Batalis of the world think that highly of Boston that they can make a run at it. If you had to name your personal favorites from Blue Ginger and Blue Dragon, what would they be and why? Editor’s note: Since publication of this interview, Blue Ginger has closed. Sake-miso marinated sablefish (a.k.a. Butterfish) from Blue Ginger. Photo credit: Emily Sterne. [Blue Ginger‘s] been open 17 years. Two days, the Butterfish was outsold. One day lamb outsold it, one day lobster outsold it. 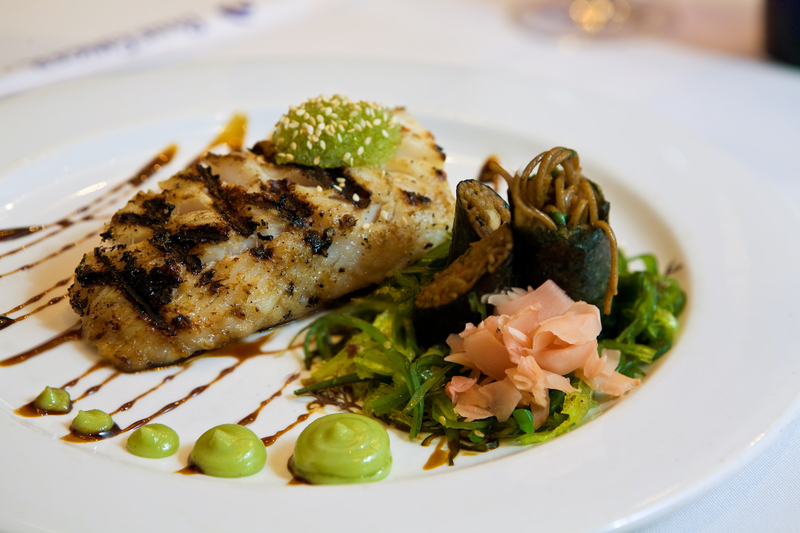 The rest of the days in 17 years, the butterfish has been the most popular dish. It’s a miso-sake marinated butterfish. It’s just an awesome, awesome dish. The fish is just beautiful, from Alaska. It’s sustainable, which I think is so important. So that would be my go-to at Blue Ginger. 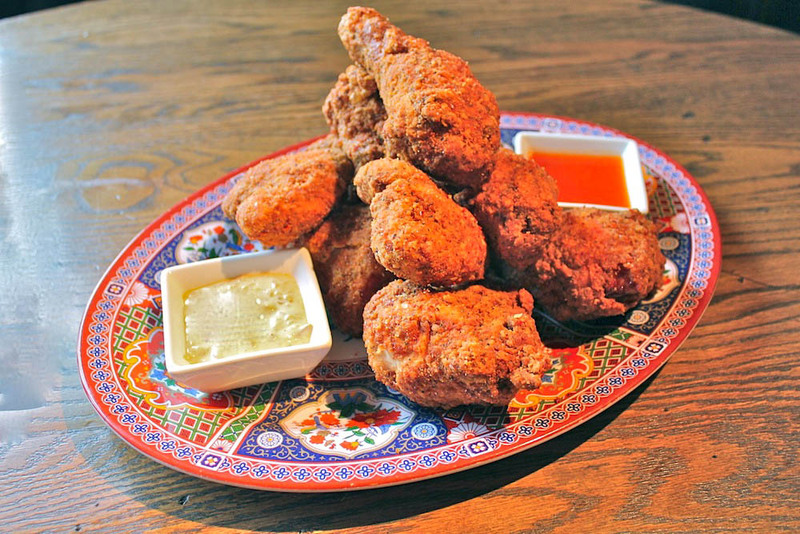 Buttermilk tempura fried chicken with sweet chili sauce and “slawce” from Blue Dragon. Photo credit: Tina Picz Photography. At Blue Dragon, believe it or not, we’ve been told by people that know fried chicken that we have the best fried chicken around, period. We do a buttermilk tempura fried chicken that is so delicious, and who thought that my most popular dish would be fried chicken? But it is. Here are two quick seconds. At Blue Dragon, the quick second is our short rib potsticker. Braised short rib for four hours, and then shredded and made into a delicious thin potsticker. Equivalent of that at Blue Ginger that’s equally popular would be our foie gras-shiitake shumai. It’s a steamed shumai, open-faced dumpling made with a foie mousse and sautéed shiitake. So those are two really popular apps, both being dim sum. Deep dish chocolate chip cookie with vanilla ice cream and soy caramel sauce from Blue Dragon. Photo credit: Nina Gallant. I would be remiss if I don’t mention dessert. I have a great pastry team here; Michele Fadden has been my pastry chef for many years. She makes just ridiculously good desserts. She does this amazing super light passion fruit panna cotta that is just to die for. Just a phenomenal dessert. She also makes the most delicious chocolate chip cookie batter. That’s double chocolate chip, tons of butter, and [Blue Dragon] executive chef Tom Woods, he will come once a week and grab a bunch of this dough. We have one dessert at Blue Dragon, and people love it. 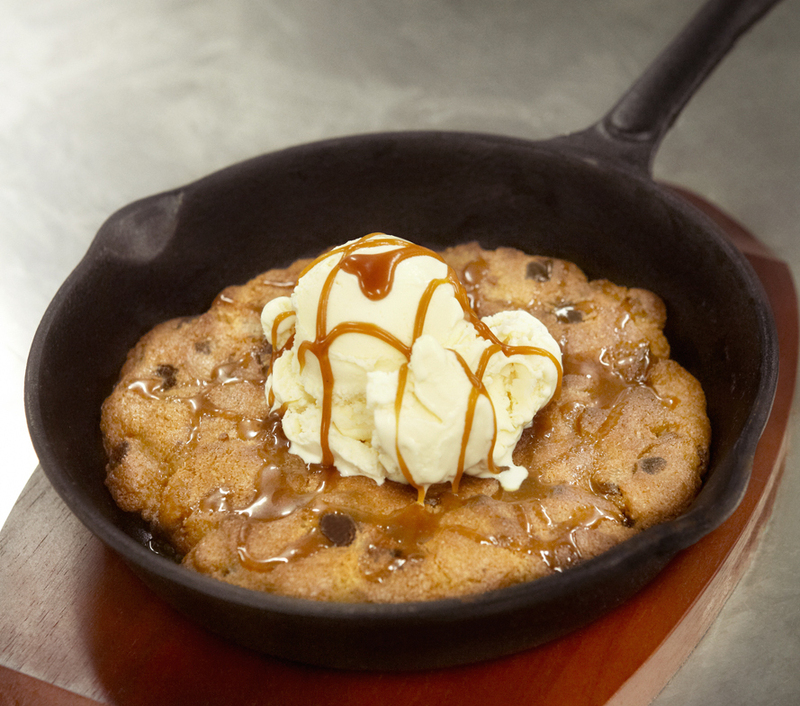 It’s just a beautiful, hot, 10-minute bake-to-order chocolate chip cookie in a big iron skillet with a big scoop of Vermont vanilla ice cream and a soy caramel sauce, and almost every table gets that. What are your favorite neighborhoods to dine out in? I do love Chinatown. If you do go to Gourmet Dumpling House, you must have this dish. It’s listed on the menu under specialties called sliced fish Sichuan style. That’s all it’s called and it’s this bowl of very brothy, spicy mala, which is tons of Sichuan peppercorns, tons of chili, chili oil everywhere. It is so freaking spicy; you take a bite, you’re like, “How am I supposed to eat this?” But as you probably know, Sichuan peppercorns then numb your mouth so that you can eat more chili and more chili. It is an unbelievable dish. And then two doors down is a great Chinese bakery. I do like Chinese bakeries because their desserts are much less sweet. They don’t put a lot of sugar in their cakes and stuff. They have great bubble tea, so that’s kind of our dessert. And then I’ll go to one of the markets down there to just buy some more stuff for dinner because obviously I love shopping with Asian ingredients. So I can do it all: park one time, get my brunch or lunch, get a dessert and get my shopping done. It’s a very clean Chinatown. It’s a small Chinatown; it’s nothing like New York, but I like it. It’s a clean, nice Chinatown. Besides there, I guess I’ve always enjoyed Cambridge, but Cambridge you can walk for days, it’s actually so big. So for a small neighborhood, it’s a little biased, but I like the new Fort Point Channel area. It’s our newest neighborhood in Boston. It’s like Boston’s Meatpacking District [in Manhattan]. All these restaurants are popping in. This is where Mario [Batali] popped in and Jeremy Sewall of Row 34. It’s becoming a dining destination and that’s cool because you can walk from Drink, Barbara [Lynch]’s place, you get a great cocktail. Then go fancy to Menton. You can get crispy clams at Row 34 or come to Blue Dragon, get yourself some dumplings and fried chicken. It’s a great neighborhood now. Jeremy Sewall’s place, Row 34, is awesome. Oishii Boston for sushi. Ken Oringer, he has Uni. Uni is a sashimi bar. Such good food. No rice. It’s not a sushi bar, it’s a sashimi bar. He has tons of great fish that are raw, some tatakis. Fantastic. And believe it or not, I will plug a chain. I think Legal Sea Foods does a really decent job with seafood. It’s super fresh. Good hush puppies, fries, slaw. It is what it is. They’re not trying to be fancy. They just want to give you the freshest seafood, and their clam chowder is quite good. Jasper White’s Summer Shack. I think Jasper White knows how to oven roast a lobster better than anyone. His raw bar program is fantastic always, and he does the best Rhode Island calamari I’ve ever had. Jasper and Lydia Shire are the two stalwarts. They’re the two that really made Boston what it is today. They hired everyone; Barbara [Lynch] worked for them, Gordon Hamersley worked for them, everyone worked for them. And I would be equally remiss because we’re on seafood, that maybe one of the best slices in town is Lydia Shire’s lobster pizza [at Scampo]. It is really good. I get it every time I go there. You eat that once a week, you’re dead [laughs]. It’s so rich, but it’s so good. Eat what you want, just work out. I have no guilt because you just eat everything, just work out. My guilty pleasure food group is fried. I like fried, that I’ll say. Fried whatever. That’s a good question. I love the fried clams at Row 34. I think they’re delicious. Clams and a glass of sauvignon blanc … it’s not really that guilty, honestly, but you can’t eat fried food everyday, obviously. Believe it or not, my sneaky go-to if I’m traveling or I’m in a hotel with a minibar and there’s a little thing of Pringles, those mini cans. I’ll open it up, I’ll take the entire stack and eat it in one bite because I love the texture of 20 Pringles at one time. The most indigenous food here is the cranberry. We have the cranberry bog in Cape Cod and everything. It’s not that hard to get, obviously; you can get cranberries anywhere in the world. I’ve always loved cranberries and I’m particularly fond of Craisins, Ocean Spray’s Craisins. They’re much less sweet than raisins and currants, but they’re tart. They’re like ginger; they’re awesome for both savory and sweet. So we put them into our desserts, but I love making cranberry sauces and chutneys and things with duck and pork. It says Christmas and the holidays, right? You have cranberries on your plate, it’s festive-looking, it’s delicious. It’s the holidays. The fruit really connotes more than just a piece of fruit. It really connotes the season. Aside from eating at Blue Ginger and Blue Dragon? I’ll tell you one thing that seems so cheesy and touristy but I’ve done it now two or three times because I have guests that visit: the duck boat tour. You always learn something new, it’s very informative, and it’s fun. I’m surprised I liked it so much the first time, and every time I’ve done it since with guests from Europe or with friends, it’s a fun little thing to do, believe it or not. You HAVE to, have to see a game at Fenway. You’re not doing yourself any service if you come to Boston during baseball season and don’t see a game at Fenway. It’s just the most iconic ballpark ever. And food-related, outside of the main gate by Cask & Flagon is this one cart and he’s called The Sausage Guy, and The Sausage Guy has the best griddled sausage with peppers and onions and you get it outside of Fenway. I will plug my friend who’s a chef at Aramark; their food is delicious at Fenway. If you’re in the EMC Club, lobster roll and pork belly and baos; I couldn’t believe how good the food was there. [Executive chef] Ron Abell’s got real talent. So I get my baseball game food of sausage before going in, and then I eat lobster rolls as I’m watching a game. It’s really a hard life. Blue Ginger, 583 Washington Street, Wellesley, MA; East-West/Asian, lunch Monday-Friday, dinner daily. Blue Dragon, 324 A Street (Fort Point); East-West/Asian tapas, lunch and mid-afternoon service Monday-Friday, dinner and late night Monday-Saturday, closed Sunday. Menton, 354 Congress Street (Fort Point); French-Italian, dinner only daily. No Name Restaurant, 15 Fish Pier Street W (Waterfront); seafood, lunch and dinner daily. KO PIes, 87 A Street (South Boston); lunch and dinner Monday-Friday, closed Saturday-Sunday. Second location: 256 Marginal Street, Building 16 (East Boston); Australian, lunch and dinner Wednesday-Sunday, closed Monday-Tuesday. Babbo, 11 Fan Pier Boulevard (Fort Point); Italian, lunch and dinner daily. Uni Sashimi Bar, 370 Commonwealth Avenue (Fenway-Kenmore); Japanese, dinner only daily. The Sausage Guy, Lansdowne Street (Fenway-Kenmore); sausages, open during Red Sox home games and Thursday-Saturday evenings. About the Chef: From his Blue Ginger and Blue Dragon restaurants, to his five cookbooks, to his “Simply Ming” series on PBS, Ming Tsai has become one of America’s most prominent chefs, known particularly for his East-West cuisine. Tsai earned a degree in mechanical engineering from Yale, but he knew his real calling was in the kitchen. He developed a love for food and cooking early on, thanks to the many hours he spent helping out his parents at their restaurant, Mandarin Kitchen. His college summers were spent studying at Le Cordon Bleu cooking school and apprenticing in Paris, and once he graduated, he plunged into the restaurant world full-time, training under acclaimed chefs in Paris and Osaka, Japan. In 1998, Tsai opened his first restaurant, Blue Ginger, in Wellesley, Mass., a suburb of Boston. He was familiar with the Greater Boston area, having attended high school at Phillips Academy in Andover, and planting his roots there made the most sense: “There just weren’t a lot of great restaurants yet. Boston was just up and coming. 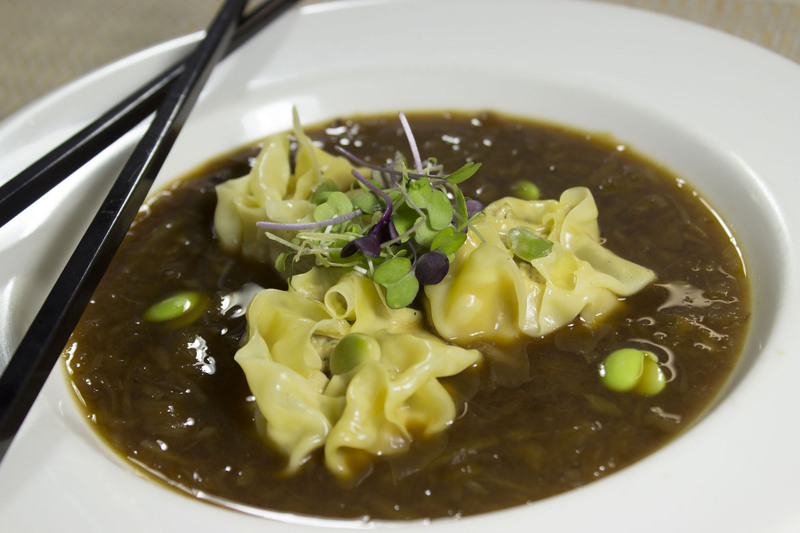 It seemed like the natural place.” Blue Ginger was met with critical acclaim, and Tsai earned a number of local and national awards. Fifteen years later, Tsai opened the highly anticipated Blue Dragon, an Asian gastropub in Boston’s Fort Point neighborhood. Tsai also uses his cooking talents for charity, and he hopes to spend more time giving back, specifically through Family Reach, of which he is National Advisory Board President. The foundation provides financial and emotional support to families coping with cancer. To date, his efforts have helped raise more than $1 million.